Bets by some of the same banks that helped Greece shroud its mounting debts may actually now be pushing the nation closer to the brink of financial ruin. Echoing the kind of trades that nearly toppled the American International Group, the increasingly popular insurance against the risk of a Greek default is making it harder for Athens to raise the money it needs to pay its bills, according to traders and money managers. These contracts, known as credit-default swaps, effectively let banks and hedge funds wager on the financial equivalent of a four-alarm fire: a default by a company or, in the case of Greece, an entire country. If Greece reneges on its debts, traders who own these swaps stand to profit. “It’s like buying fire insurance on your neighbor’s house – you create an incentive to burn down the house,” said Philip Gisdakis, head of credit strategy at UniCredit in Munich. As Greece’s financial condition has worsened, undermining the euro, the role of Goldman Sachs and other major banks in masking the true extent of the country’s problems has drawn criticism from European leaders. But even before that issue became apparent, a little-known company backed by Goldman, JP Morgan Chase and about a dozen other banks had created an index that enabled market players to bet on whether Greece and other European nations would go bust. Last September, the company, the Markit Group of London, introduced the iTraxx SovX Western Europe index, which is based on such swaps and let traders gamble on Greece shortly before the crisis. Such derivatives have assumed an outsize role in Europe’s debt crisis, as traders focus on their daily gyrations. A result, some traders say, is a vicious circle. As banks and others rush into these swaps, the cost of insuring Greece’s debt rises. Alarmed by that bearish signal, bond investors then shun Greek bonds, making it harder for the country to borrow. That, in turn, adds to the anxiety – and the whole thing starts over again. 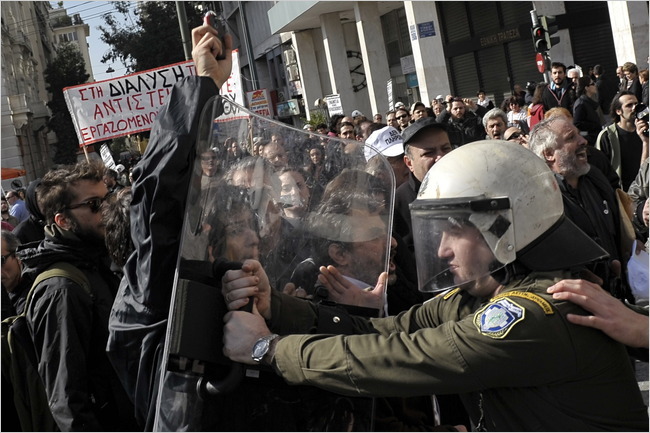 On trading desks, there is fierce debate over what exactly is behind Greece’s recent troubles. Some traders say swaps have made the problem worse, while others say Greece’s deteriorating finances are to blame. “This is a country that is issuing paper into a weakening market,” said Ashish Shah, co-head of credit strategy at Barclays Capital, referring to Greece’s need for continual borrowing. But while some European leaders have blamed financial speculators in general for worsening the crisis, the French finance minister, Christine Lagarde, last week singled out credit-default swaps. Ms. Lagarde said a few players dominated this arena, which she said needed tighter regulation. Trading in Markit’s sovereign credit derivative index soared this year, helping to drive up the cost of insuring Greek debt, and, in turn, what Athens must pay to borrow money. The cost of insuring $10 million of Greek bonds, for instance, rose to more than $400,000 in February, up from $282,000 in early January. On several days in late January and early February, as demand for swaps protection soared, investors in Greek bonds fled the market, raising doubts about whether Greece could find buyers for coming bond offerings. The Markit index is made up of the 15 most heavily traded credit-default swaps in Europe and covers other troubled economies like Portugal and Spain. And as worries about those countries’ debts moved markets around the world in February, trading in the index exploded. In February, demand for such index contracts hit $109.3 billion, up from $52.9 billion in January. Markit collects a flat fee by licensing brokers to trade the index. European banks including the Swiss giants Credit Suisse and UBS, France’s Société Générale and BNP Paribas and Deutsche Bank of Germany have been among the heaviest buyers of swaps insurance, according to traders and bankers who asked for anonymity because they were not authorized to comment publicly. That is because those countries are the most exposed. French banks hold $75.4 billion worth of Greek debt, followed by Swiss institutions, at $64 billion, according to the Bank for International Settlements. German banks’ exposure stands at $43.2 billion. Trading in credit-default swaps linked only to Greek debt has also surged, but is still smaller than the country’s actual debt load of $300 billion. The overall amount of insurance on Greek debt hit $85 billion in February, up from $38 billion a year ago, according to the Depository Trust and Clearing Corporation, which tracks swaps trading. Markit says its index is a tool for traders, rather than a market driver. In a statement, Markit said its index was started to satisfy market demand, and had improved the ability of traders to hedge their risks. The index and similar products, it added, actually make it easier for buyers and sellers to gauge prices for instruments that are traded among players over the counter, rather than on exchanges. Some money managers say trading in Greek swaps alone, not the broader index, is the problem. If that sounds familiar, it should. Critics of these instruments contend swaps contributed to the fall of Lehman Brothers. But until recently, there was little demand for insurance on government debt. The possibility that a developed country could default on its obligations seemed remote. As a result, many foreign banks that held Greek bonds or entered into other financial transactions with the government did not hedge against the risk of a default. Now, they are scrambling for insurance.